The aim of »A Literary Atlas of Europe« is a methodologically advanced literary geography, which can give consideration to the object itself – literature and its almost infinite possibilites to create numerous spaces and places. If this objective is to be achieved it is unthinkable if one of the two involved disciplines – literary studies and cartography – would start off single-handedly. Only by teaming up in an interdisciplinary approach, by constant mutual exchange and adjustments between literary theory and cartographic practice, the rather vaguely defined field of literary geography can actually take shape (see also Hones 2008). 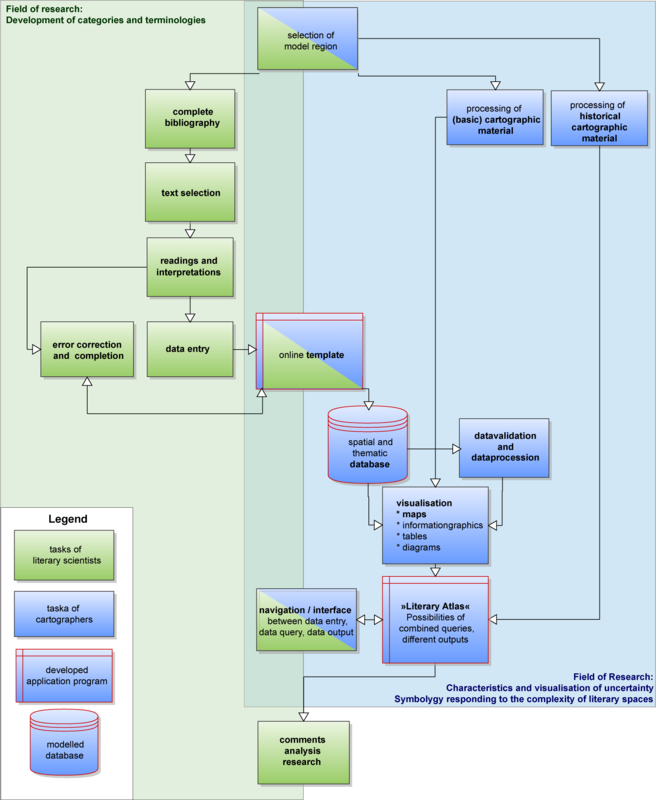 The methodological base structure, from which the individual methods and fields of activities derive is the following: initially formalised interpretations of literary works are followed by cartographic processes of literary geography – the emerging maps are intermediary results and as such in their turn starting points for new research topics in the field of literary studies. The common theoretical frame of reference consists of various areas: central are previous attempts at literary geography. In order to expand the possibilities of literary cartography, which up to now have been rather limited, literary studies are reliant on the contributions from fiction theory and narratology. Useful ideas and concepts for cartographers are to be found in the field of imprecise geography, which is presently in the process of establishing itself as a superordinate concept for a number of approaches regarding visualisation and related areas. During the process of developing the »Literary Atlas of Europe« these completely different elements will have to form a shared theory. A model that could serve as an example does not yet exist. The fields of responsiblity have been structured in a clear and logic way (see fig. 9); But the major challenges have to be seen in the above described intersections – there, the actual research efforts take place, since it means nothing less than to enter uncharted territory. are responsible for the overall conceptual structure of the project; they develop categories, terminologies and not at least pose the relevant research questions. They select the texts and interpret them; they enter the data in the database (via online submission form), also in the subsequent phase of correcting them and adding to them. And finally, they are responsible for commenting and interpretating the newly generated maps. take care of all technical issues, that are inherent to an interactive thematic atlas: programming of the online submission form, programming and maintaining the database, preparation of the map material for digital use (base maps), coordination of the various tools and functions. The crucial challenge, however, is the development of graphic symbols and metaphors that help to best visualise literary “parameters”, in short: their core task is to visualise the data that literary scholars extract from the texts. Quite naturally there will be a number of overlap areas during the operational procedures, which require a culture of interdisciplinary cooperation. Whatever will be programmed by cartographers, will have to be checked by the literary scholars when entering the data. The point is not only the technical functionality of the system, but first and foremost the logic of the system with regards to content. In this respect the project is also about the joint development of novel literary geographic and cartographic methods. Thus the respective disciplines contribute with their knowledge, their special competence and their demands for quality in equal parts.